Note: On December 1, 2013 the Lord Called Pastor Deepak Dhingra. 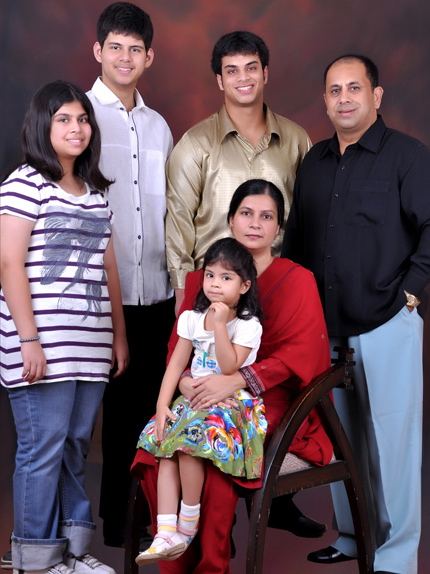 His wife Simmi and the entire family and staff of NICM are dedicated to the dreams and hopes Deepak had for the work of God in the Northwest of India. This testimony speaks of Deepak and Simmi’s love for the Lord. Please pray for the family as they continue to serve God in Northwest India. The world would call us converts to Christianity. Our conversion is not a change of religion; but a transformation for life; complete reformation of thinking; a revamp of attitudes; complete metamorphosis of the heart; re-alignment of our priorities and change in life-style. Why? Simply because we discovered a faith and hope for eternity. My wife Simmi and I were born Hindu/Sikh. My family is Hindu and Simmi’s father is Hindu and her mother is a Sikh Kshtraya family. I guess that would make us high-caste Hindu’s. Our Families are educated, middle class who run successful businesses in Banglore and Amritsar. The general perspective is that only those from tribes, the poor, the uneducated, and people from the lower castes choose Jesus Christ. But that is not the case with us, as we have freely chosen to become followers of Jesus Christ. For the record, no one has financially induced or threatened or deceived us into converting to Christianity. We are proud of India, our country, our Culture and heritage and identify our selves as patriotic Indians We are completely at peace with our cultural identity as a Hindu/Sikh and we continue to retain the names given by our respective parents as does our family which continues to go by our Hindu names and identity. We have four children and we have given all of them Hindu names. In fact, many of our colleagues and acquaintances are likely to be surprised and have no inkling about our faith, for we generally don’t go about announcing it. But, if someone does ask us the reason behind the joy and hope that is ever present in our lives we are always delighted to share with them and anyone else who is curious. We see our faith more as a relationship with God through Jesus Christ than as a religion. We write this piece to make one point—that our conversion is not a change of religion but a change of heart. To explain this, I, Deepak, need to go back to my childhood in Amritsar and Bangalore. My father, every bit the virtuous priest of the family, had enormous influence over me. I absolutely adored him and as small boy, always was with him. My mom loved me to a fault. There was no wish of mine that they would not rush to fulfill. But even in my early, formative years I was unable to relate to the religion they fervently practiced. They taught me many Sholaks from the Vedas and other Hindu literature as well as various Bani’s from the Sikh Holy Book, and to this day, I remember most by heart. However, I never understood any of it and none of it helped me connect with God. I, Deepak, was young, directionless, disoriented, and completely lost. I was addicted to every vice; liquid, spirit or vapors that the world offered. I never refused an invitation to a party, wedding, Puja or Jagrata be it at a club, a pub, a party hall, hotel or any place. One day I was invited to go to church in Bangalore and I accepted the invitation. The Pastor and his congregation prayed for me. It was a simple yet delightful conversation with God that lasted all of five minutes. I don’t remember it verbatim, but they articulated a prayer of blessing on my life, future, career and family. All they did was utter a deep human plea to the creator God and His only son Jesus Christ on my behalf. When they said Amen, I felt in my heart a desire to follow Jesus. It was a simple affair—no miracles, no angels visiting, no inner turmoil or struggle. It was just a plain powerful feeling I cannot describe – a faith encounter with God that I shall not even attempt to understand, rationalize or explain. I simply accept it. It is my faith. It is what I choose to believe. That evening I did not change my religion, for in reality I had none. Hinduism was my identity, not my religion. The Christianity I acquired that evening is not a religion. On the contrary, it is an intensely intimate relationship with Jesus. Ever since my transformation, I have come to know Jesus Christ even closer. I know Him as the pure and sinless Son of a Holy God. And I know Him as a dear friend to whom I pray and talk to every day—about every thing related to my life including the mission work. Today, more than twenty-five years later, I continue to believe that people, young and old, need to know about God’s love and salvation. God graciously rescued me from a destructive lifestyle during my teen years. Yes, I have failed many times in adult life even after the change of my heart. However, I find it amazing that in spite of all my faults God continues to rescue me to this day. Simmi and I are ever so grateful to God for the Waldock family in Bangalore who led us to change our hearts and accept Jesus Christ as our Lord and Savior. After becoming Christians we traveled to many places and lived in many countries across the globe, looking for better prospects. We finally understood that God’s calling was for us to return to our home in India and that our citizenship is in Heaven. We returned back from USA in response to this Higher Calling and started serving God. Under the leadership of Eastview Christian Church in Indiana we returned to our home area and formed North India Christian Mission where we began to reach out to our countrymen and God has blessed our initiative. Through Christ we have received Peace, Joy and Happiness. We have discovered a truly amazing friend, guide, leader, savior and God. Why should we not share this happiness, peace and Joy? Why can we not tell all our friends about Him? And if anyone does listen and he too comes to believe in Jesus, we are delighted. The world would call it a conversion; we call it a change of heart, like ours. Just as no one from the church we were part of in Bangalore, nor any Christian friends, who today are all over the world, ever did anything to persuade or force us to be Missionaries or become Evangelists,we would never force anyone to listen to us and would never financially induce, coerce or con people into believing. To us such actions are pointless and against the very grain of our faith. A relationship with Christ is based on personal conviction and must be made by the individual totally through belief and acceptance of Christ as Savior. However, we do have a constitutional right to practice our faith and to preach it without deception, force or bribery as guaranteed by the Constitution of the Republic of India. It pains us to see such gross violations and sheer disregard of the Fundamental Rights and abasement of basic human rights because of one’s Religion in India. God bless India, a great Nation, a sovereign democratic and secular country. We pray that one day barriers that bind this country and discriminations based on Religion, Caste, Creed and Region will be broken.